The whisky production process is dependent on a hospitable environment, from the right temperatures to grow barley to favourable weather conditions to avoid delays in distribution. But climate change poses a very real threat to the industry. Felipe Schrieberg explores the key challenges facing Scotch whisky producers and what can be done about them. Nowadays, the notion that climate change is affecting our planet is widely accepted (well, in most countries at least) and acknowledged by governments around the world (again, by most governments). And though residents in Scotland could be forgiven for enjoying rising temperatures, the effects of climate change are being felt there in ways that are good, bad and uncertain. The facts are hard to ignore: the entire planet is heating up. The fifth assessment report published by the International Panel on Climate Change confirms its previous conclusions. Greenhouse gas emissions from human activity are changing the Earth’s climate system. Rising sea levels and warming temperatures are already having a significant impact, affecting global ecosystems and human societies. Scotland is no exception. Between 1961 and 2006, the Scottish Environment Protection Agency (SEPA) reports the nation’s average spring, summer and winter temperatures have risen by nearly one degree Celsius – a significant amount. Scotland is also much wetter, with the average annual precipitation rate up 27% during this time. The temperature of the seas around Scotland has risen by an average of one degree Celsius over the past 20 years, and sea levels have also risen around all Britain’s coastlines, with Aberdeen holding the record with a 60mm increase since 1920. Scotland faces enormous challenges thanks to climate change. But what does this mean for the Scotch whisky industry? How can distilleries prepare for the impact of climate change in future? First, let’s look at the challenges the industry faces. It’s always better to start with the good news. Increased temperatures across the UK mean barley crops – a key ingredient in whisky – will remain steady, and yields may actually rise. SEPA reports that Scotland has already begun to see its growing season start earlier and last 30 days longer than in previous years. A 2016 study published in the journal Climate, which examined the effects on British barley production, documented increases in baseline barley yields in the west of the UK. But – and here the bad news begins – some regions, including south-west Scotland, saw a reduction due to soil saturation. Grain whisky may also suffer as rising temperatures damage the UK’s wheat crop, which is often used in making the grain whisky that typically goes into blends – an export market worth almost £3bn a year. A 2009 study in the Journal of the Royal Society Interface revealed that wheat crops could also be severely affected by rising temperatures (though not as much as by climate change-induced water issues) and recommended focusing on creating varietals tolerant to high temperatures. So, despite the potentially encouraging outlook for barley crops, it’s not all sunshine and rainbows. Ecosystems are being radically altered as climate change brings about more invasive non-native species of flora, fauna and fungi, with the potential to affect and damage crops. For example, Corsican pine – an important commercial product – is increasingly under attack by red band needle blight, which normally thrives in more humid and warmer climates. This carries a similar threat for grain crops. Rising temperatures have also severely reduced Scotland’s snow cover. Less snow – and snow that melts faster – affects the replenishment of groundwater levels, which could in turn damage whisky production. It’s easy to assume that with increased rainfall, water shouldn’t be a problem. Unfortunately, more water does not automatically mean more ‘water of life’ because it’s how the rain falls that is important. The risk of floods – especially from Scotland’s rivers – is increasing, which would have implications for facilities, crops and logistics such as storage and transportation. Add more intense rain storms to the rapid melting of snow water and the situation becomes more dangerous still. SEPA has produced a map of at-risk flooding areas, which includes 100,000 properties, around 4% of Scotland’s total. To give an example of the potential problems flooding could cause, one 1997 flood in Elgin – an important Speyside whisky town – caused £100m in damage and the evacuation of 1,200 residents. At the opposite end of the spectrum there are droughts. Brought on by extreme weather variations, a lack of water poses another set of impediments. A joint report from Climate UK and the Scotch Whisky Association (SWA) warned that droughts can lead to low flow from burn/river water sources and higher water temperatures. This makes cooling less efficient and adversely affects how distilleries deal with effluent discharges. Plus, temperature variation in water can even change the flavour of the whisky itself. Extreme weather events can also impact the ferries that supply island distilleries with what they need to make whisky, as well as shipping out the finished products they produce. Delayed and cancelled ferries can mean shortages and distribution delays. Rising sea levels, as well as the fact that Scottish seas are getting warmer, also have significant potential impacts. Higher tides, combined with an increased number of storms, greatly increase the chances of coastal flooding and erosion, which may present problems for distilleries directly next to the sea. The SWA and its members are aware of the potential problems posed by climate change and take it very seriously. According to the industry body, in 2009 Scotch whisky’s greenhouse gas emissions were estimated to cover 3.3% of Scotland’s total output. As a result, the industry as a whole has come together to reduce its carbon footprint in a number of ways, such as finding more efficient methods of dealing with waste, reducing water usage, and engaging in a variety of laudable water and ecosystem conservation projects. 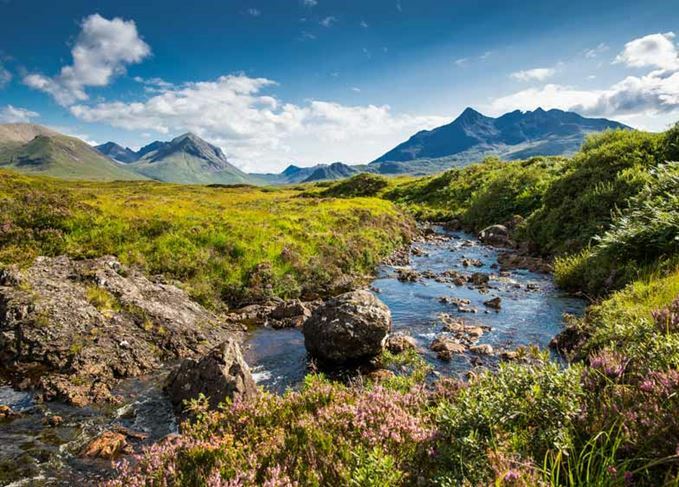 Since 2010, the SWA has released an Environmental Strategy roughly every two years, which details the commitments made by its members, who represent 95% of the distilleries in Scotland. There is nothing else like it for any other sort of Scottish industry. Results have been encouraging. In 2015, emissions per unit of energy had fallen 13% since 2008, with 1% overall reduction in total emissions despite increased production levels. Fossil fuel use has fallen, with 17% of total energy coming from non-fossil fuel sources, an increase of 3% from 2008 and a positive step towards the 20% target by 2020. Water use has also decreased by 14% compared to 2008 levels. The industry is also involved with a number of interesting conservation projects. Glenmorangie has committed to help regenerate oyster and mussel beds in the Dornoch Firth. Knockdhu has built a wildlife-friendly wetlands area to manage waste by using plants that can process the materials present in the waste. Meanwhile, Diageo provides financial support to the Spey Catchment Initiative, a project for the River Spey that enhances the river’s resilience against the effects of climate change and reduces pollution – for example by finding alternative grazing areas for livestock that were previously polluting the river. The industry is inarguably making concerted efforts to combat the effects of climate change while ensuring the production of Scotland’s golden liquid continues for many years to come. However, it’s still entirely possible that environmental developments caused by a climate change could severely impact production. But by and large, it’s hard to know with absolute certainty whether many of these effects will happen or not. As a result, it’s imperative the industry proceeds with caution, remains aware of the risks of climate change and prepares for any worst-case scenarios that could occur in the future. The story of the African orphan who became a famous figure in the Speyside town of Rothes. Owned by its community, a new form of whisky distillery is giving back to the local economy. American craft distillers are breaking from tradition to explore new avenues of flavour creation. The city that ruled the whisky world is back in the spotlight after decades of decline.